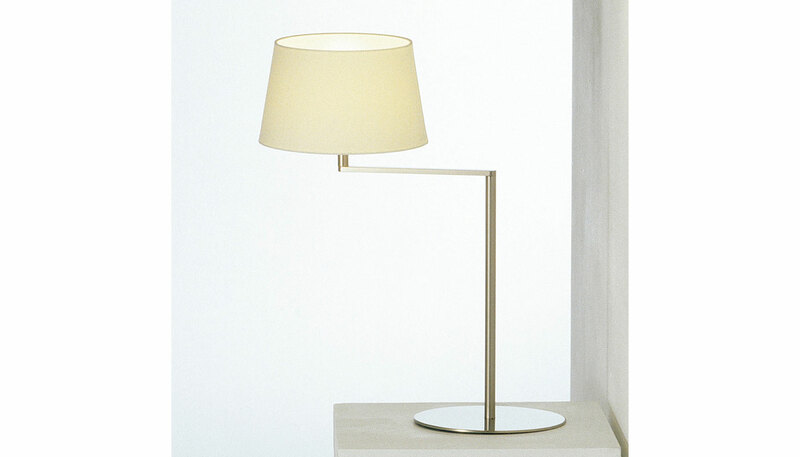 The Americana series of lamps was designed by Miguel Mila in the mid 1960s and pays homage to George Hansen’s iconic 1950s lamp collection originally manufactured by Metalarte, Spain. The Hansen lamps are based on a rotating arm with a swivel situated in the middle dividing the horizontal axis into two sections: one end is pinned onto the vertical shaft of the lamp holding it aloft and the other end is fastened onto the shade support. Resultingly, the whole arm can swing around, be folded in or opened out from the middle. Mila first designed the Americana table lamp in 1964; wall and floor versions of the design followed in 1999 and 2000 respectively. Noted here is the Americana table lamp - each version of Americana features a chic juxtaposition of satin nickel with a white linen shade.